Beauchamp Foot Care offers safe and effective toenail fungus treatment using laser technology. This method has demonstrated itself as one of the most effective toenail fungus treatments available, and our registered practitioners have extensive experience using laser treatment for toenail fungus. Call us today for an initial consultation at 0800 907 0093 or click here to contact us through our online form. Onychomycosis or nail fungus is a fungal infection of the nail, the nail bed or the area immediately surrounding the fingernail or toenail. 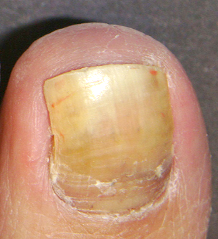 The nail itself can appear thickened, yellow, or odorous and even separate from the nail bed. This can result in a painful, uncomfortable or embarrassing problem. Conventional treatments such as topical and oral medications don’t always work and oral medications carry an additional risk of side effects that can damage the liver. At Beauchamp Foot Care, we provide our patients with a non-invasive option for toenail fungus treatment using the Lunula Laser. This revolutionary procedure is proven safe and effective. There are no medications required or unpleasant side effects as with conventional methods. The treatment takes only 12 minutes per foot and no downtime is required. Results are typically visible within the first three months. 0800 907 0093 or fill out the form on this page. You can expect a response within 24 hours. Click here to discover the revolutionary new laser treatment.